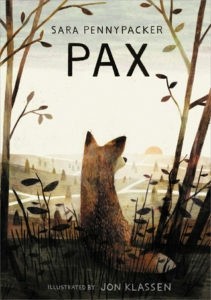 Pax by Sara Pennypacker is a young adult novel geared for kids aged eight to twelve. I first saw it on NPR’s Best Books of 2016 List, but it is also on the National Book Award Long List. I often enjoy young adult novels because they have a sweet simplicity that is appealing. I also enjoyed reading Pax. Peter is twelve years old and has been living with his dad and caring for his pet fox, Pax, for five years. He found Pax as a kit and the two are inseparable. Pax is fully tame and devoted to his human. But Peter’s father has enlisted in the army, and Peter has to go live with his grandfather. On the way there, Peter’s father stops the car, and says they have to leave Pax because Peter’s grandfather can’t handle a kid and a fox. Peter tricks Pax by playing fetch, and Peter and his father drive away, leaving Pax behind. I can’t imagine anyone getting through this part of the book without crying. At his grandfather’s house, Peter is haunted at how he left Pax. He knows that Pax can’t survive on his own and decides to head out and go find him. Unfortunately for Peter, his plans quickly go awry, and after a number of mishaps, he ends up breaking his leg and crawling into a barn for shelter. He is awoken by Vola, an intimidating veteran from another war who is missing a leg. She has her own issues from her war, and uses her isolated home to hide away. Vola and Peter help each other out, as Peter heals physically and Peter draws Vola out using her own rules. Pennypacker alternates the point of view between Peter and Pax. One remarkable thing I found about this book was how realistic Pennypacker makes Pax and the other foxes in the story. Although she has them speaking English, they still feel like genuine animals. I was also not expecting that war would be a major plot point in this book. Vola is affected by war, war tears Peter from his father and Pax, and war threatens Pax and Peter later in the story. “And why didn’t anyone count those things? ‘People should tell the truth about what war costs.’ Vola had said. Weren’t those things the costs of war, too?” (250) I appreciated that the element and costs of war added a lot to this story. However, the author makes this an unnamed war in an unnamed place, and I found it distracting. This may not be much of an issue for the intended age range, but I wanted to know where this was happening. I was curious where this war was that took over Peter’s old neighborhood so quickly. I would have liked it to be grounded in a real place and real circumstances. This book was much more than I expected. I love animals, and I love the way Pennypacker portrayed Pax in this story. I also appreciated the complexities that came with the war and Peter dealing with the loss of his mother. Share the post "Fox and friends"